Provide comfort for the family of Ray E. Shepherd Jr. with a meaningful gesture of sympathy. 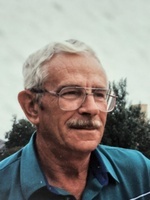 Ray Edward Shepherd, Jr. passed away peacefully Saturday, March 2, 2019. He was born in Greenville, TX on December 25, 1929 to the late Ray and Zora (Porter) Shepherd. Ray graduated from Point High School. He married his other half, Wanda McKee, and they had 3 children, Ricky, Eddie and Jana. Ray worked in the oil and gas industry, most notably as a supervisor for Shell where he worked for 40 years. He enjoyed the simple things in life such as playing 42 with friends and going on trail rides. Ray retired to Mineola, Texas where he enjoyed meeting his friends for coffee at the Dairy Queen and faithfully spending time with his church family at the Broadstreet Church of Christ, and later the Mineola Church of Christ. After Wanda passed away, Ray found love again and spent a few years married to the late Dottie Shepherd. Ray is survived by his brother, Grady; Grandchildren, Ricky, Katie (John), William and Rachel (Tom); Great Grandchildren, Brooke, Hunter, Kalem and Noah; and beloved nieces, nephews and other family. In lieu of flowers, please consider making donations to the Mineola Church of Christ in Ray’s name. Services will be Saturday, March 9, 2019, 9:30 am at Roselawn Memorial Gardens. To send flowers in memory of Ray E. Shepherd Jr., please visit our Heartfelt Sympathies Store. We encourage you to share your most beloved memories of Ray E. Shepherd Jr. here, so that the family and other loved ones can always see it. You can upload cherished photographs, or share your favorite stories, and can even comment on those shared by others.